We’d love your help. Let us know what’s wrong with this preview of Ursula K. Le Guin by Ursula K. Le Guin. When the New York Times referred to Ursula K. Le Guin as America’s greatest writer of science fiction, they just might have undersold her legacy. It’s hard to look at her vast body of work?novels and stories across multiple genres, poems, translations, essays, speeches, and criticism?and see anything but one of our greatest writers, period. In a series of interviews with Da When the New York Times referred to Ursula K. Le Guin as America’s greatest writer of science fiction, they just might have undersold her legacy. It’s hard to look at her vast body of work?novels and stories across multiple genres, poems, translations, essays, speeches, and criticism?and see anything but one of our greatest writers, period. To ask other readers questions about Ursula K. Le Guin, please sign up. A friend gave me this little book last summer. I hadn’t been that familiar with LeGuin, who died 1/20/18, though I read a collection of her essays at that time. In my youth I read at least one volume of that fantasy series, The Wizard of Earthsea, and the feminist science fiction The Left Hand of Darkness. I had had no idea she had written several books of poetry in addition to a real range of fiction, collections of essays, several children’s books. She wrote books on writing, too, and this book collects three interviews with David Naimon on topics dear to her: fiction, poetry and non-fiction, all conducted when she was in her late eighties. Reflections on her life as writer, focused on craft, though it reveals a wide range of reading, not just in fantasy and science fiction—for which she is best known—but in everything from Rilke to Wittgenstein. Especially for writers, it’s warm and relaxed and insightful. Conversations on craft with a writer’s writer, and luckily Naimon knows her work and thinking well. I like how they include excerpts from writers they discuss as illustrative examples throughout. "I hear what I write. I started writing poetry when I was really young. I always heard it in my head. I realized that a lot of people who write about writing don't seem to hear it, don't listen to it, their perception is more theoretical and intellectual. But if it's happening in your body, if you are hearing what you write, then you can listen for the right cadence, which will help the sentence run clear. And what young writers always talk about—‘finding your voice’--well, you can't find your own voice if you aren't listening for it." Two small things: 1) The book made me want to seek out her acceptance speech for The Medal for Distinguished Contribution to American Letters in 2014 which is said to be a rant about the commodification of writers and writing; 2) I did like a very short essay “On Serious Literature” included here ranting against the notion of the supposed superiority of “literary” fiction to “science fiction,” though in it she disses Cormac McCarthy’s The Road, which is one of my favorite books of all time. That made me a little grumpy. Essentially an interview in book format, a conversation in three parts (fiction, poetry, non fiction) between Ursula K. Le Guin and David Naimon. This is really an amuse-bouche of a book, a taste of Le Guin's formidable intellect and opinions on a wide-range of topics relevant to the craft of writing. If nothing else this has made me want to seek out Le Guin's book reviews and her blistering acceptance speech for The Medal for Distinguished Contribution to American Letters in 2014, in which she Essentially an interview in book format, a conversation in three parts (fiction, poetry, non fiction) between Ursula K. Le Guin and David Naimon. This is really an amuse-bouche of a book, a taste of Le Guin's formidable intellect and opinions on a wide-range of topics relevant to the craft of writing. If nothing else this has made me want to seek out Le Guin's book reviews and her blistering acceptance speech for The Medal for Distinguished Contribution to American Letters in 2014, in which she takes aim at the commodification of the publishing industry. This is a nice little reference book that has lead me to add more books to my reading list, particularly Le Guin's own book on reading and writing called Words Are My Matter which I hope will flesh out topics that are touched on too briefly here. I must admit I was disquieted to see Cormac McCarthy's The Road getting rather a lambasting from Le Guin. The Road seems to be the example she uses to examine the "culture wars" of genre vs literary fiction. McCarthy's version being marketed as literary fiction rather than science fiction and telling a story that has been done many times over by capable science fiction writers with much less fanfare. This all maybe perfectly true, but it does not diminish my own love for McCarthy's version. It’s lovely to have a transcript of UKL’s conversations with David Naimon. Excerpts of most of the works mentioned (whether UKL’s or others’) are included, which is a really lovely touch. At different points in my reading life I have promised myself I was going to read something by Ursula K. Le Guin. So, when she died in January of this year at the age of 88, I had that feeling of regret a reader can have - of not being able to join in the celebration of the impact of a writer’s work on my own consciousness. Shortly after, I saw this book on the shelf at my public library and decided to begin getting acquainted with the ideas of Ursula Le Guin by “eavesdropping” on her conversatio At different points in my reading life I have promised myself I was going to read something by Ursula K. Le Guin. So, when she died in January of this year at the age of 88, I had that feeling of regret a reader can have - of not being able to join in the celebration of the impact of a writer’s work on my own consciousness. Shortly after, I saw this book on the shelf at my public library and decided to begin getting acquainted with the ideas of Ursula Le Guin by “eavesdropping” on her conversations with David Naimon. Less than 140 pages, this small book is rich with Le Guin’s ideas about writing, from the rhythmic and sonic characteristics of language, to technical aspects such as grammar and form. She shares her thoughts on genre, imagination, and the limits of stories that are driven by conflict, only. She defines “technology;” and speaks truth to publishing industry power. In all of these things her voice comes through as compassionate, tolerant, deeply hopeful and humane. A window into the contemplative mind of one of the most important contemporary authors, irrespective of genre, and a reminder of the invaluable literary jewel we recently lost. As it sounds, a series of conversations about the art of writing, language, the industry. The conversation is interspersed with black pages citing excerpts in example of the topics discussed. One such page involves Le Guin diagramming a sentence from 1984, demonstrating that sentences are all different animals, each with their own gait. Her way of thinking about written communication and language is magical. Thanks to Tin House for sending me a review copy! What a brilliant, brilliant woman. This is a quick little book - not even a hundred and fifty pages - but I found it delightful and thoughtful as both a reader and a writer. In its three parts, Naimon and Le Guin discuss her fiction, poetry, and nonfiction. Along the way are short excerpts from the pieces they're discussing, which made the conversations so much more fascinating to read. I especially loved Le Guin's perspectives on language and "gra Thanks to Tin House for sending me a review copy! I especially loved Le Guin's perspectives on language and "grammar bullies," her thoughts on genre fiction and sci fi - oh, and the entire poetry section! When reading poets in translation, she describes how she would sit with a book of poetry and translate it herself! Even from unfamiliar languages - because that's how you get to really know a poet. So many gems in this book; so looking forward to exploring more of her poetry. This is a beautiful little book, packed with not only the conversations referenced in the title, but also excerpts of the works the conversations refer to. I love everything she says about writing, always. On the one hand, this is a slight volume that largely recovers material gone into in more depth in Words Are My Matter: Writings About Life and Books, 2000–2016, with A Journal of a Writer's Week. On the other hand, it's (some of) the last words of one of our best and brightest. It's short enough to read in a single evening. You could do a lot worse with your time. To be able to visit the mind of an author is a transcendent experience. Like sitting down with a cup of rich coffee, reading what Ursula K. Le Guin has to say about writing, philosophy, and the world in general is like watching the words lift off the page and circle before handing on your tongue. They are delicious. They are brutally honest. They are awe-inspiring. I read the book in two sittings. I will reread it more slowly, savoring each sentence, each new thought, to get the most out of it. A To be able to visit the mind of an author is a transcendent experience. Like sitting down with a cup of rich coffee, reading what Ursula K. Le Guin has to say about writing, philosophy, and the world in general is like watching the words lift off the page and circle before handing on your tongue. They are delicious. They are brutally honest. They are awe-inspiring. I read the book in two sittings. I will reread it more slowly, savoring each sentence, each new thought, to get the most out of it. When I saw how slight this volume is -- 138 pages, small pages, widely-spaced lines -- I expected the content to be good, but slight. I am happy to report that, no, this volume had a very good ratio between signal and noise. It generated as long a reading/rereading list as I got from Dancing at the Edge of the World, which I recently finished. As someone who publishes fiction and poetry and essays, it was nice to read a book about a writer who works in all three modes; and takes them on one-by-on When I saw how slight this volume is -- 138 pages, small pages, widely-spaced lines -- I expected the content to be good, but slight. I am happy to report that, no, this volume had a very good ratio between signal and noise. It generated as long a reading/rereading list as I got from Dancing at the Edge of the World, which I recently finished. As someone who publishes fiction and poetry and essays, it was nice to read a book about a writer who works in all three modes; and takes them on one-by-one. That was, ah, encouraging. I will also say that the poem "The Small Indian Pestle at the Applegate House" was, all by itself, worth the price of the book. I have not read much of Le Guin's poetry; clearly I need to remedy that. I very much liked that example texts (from Virginia Woolf, J.R.R. Tolkien, etc.) were included. I also admired the way it was done in this nicely-produced volume: white ink on black pages, inserted in the interview at the appropriate locations. One of the issues that comes up often in workshops and student interactions is the question of what constitutes "style" and how a writer can find a "voice." I have several approaches to this, but there's an answer in here that I'm going to be quoting from now on. Naimon reads her a quote of her own about voice and rhythm, and she replies, "That is something I learned from Virginia Woolf, who talks about it most wonderfully in a letter to her friend Vita. Style, she says, is rhythm--the 'wave in the mind'--the wave, the rhythm are there before the words, and bring the words to fit it." If you explain to a writer that they already have a rhythm to their speech, and all they need to do is fit the words into it, I suspect it will eliminate some false hurdles. So this book is sending me back to Woolf, and Orwell's essays, and Houseman's poems, and Le Guin's other essays, and I go willingly and happy for the being sent. Must read. A writer's comfort. Human comfort, really. Thanks to Ursula K. Le Guin in the Beyond and thanks to David Naimon for both of your brilliant minds. I thoroughly enjoyed this lovely book - it was stimulating, inspiring, and very intelligent. The book consisted either of one big interview that had been split into 3 parts or three different interviews that were put together in one book with the interviewer's musings about Le Guin's style and contribution to literature. The book also contained quotations from poems and novels that were mentioned during the conversations. These were just a blessing. They definitely stood out as they were printed I thoroughly enjoyed this lovely book - it was stimulating, inspiring, and very intelligent. The book consisted either of one big interview that had been split into 3 parts or three different interviews that were put together in one book with the interviewer's musings about Le Guin's style and contribution to literature. The book also contained quotations from poems and novels that were mentioned during the conversations. These were just a blessing. They definitely stood out as they were printed on black sheets, and they helped so much as they were placed in the book right on the next page, and a reader who has not read these poems or passages from novels or even if they did read them, did not feel left out of the conversations. Because of the personal choice, I found that I liked the first conversation about prose most as it was closer to my reading heart. I was pleasantly surprised not only by the depth of the conversation, but by the scope of it. When it comes to creative writing, many people ( authors and critics included) prefer to talk about very literary topics ( themes, characters, feelings, etc), but Le Guin addressed the topic on grammatical and semiotic level of writing that is often excluded from literary conversations as if form somehow is subsidiary to ideas while, in fact, language represents the duality of form and meaning. I think it is partially the reflection of the USA educational system when linguistics and literature are viewed as totally separate entities, and that has always perplexed me, and I was so grateful that Le Guin showed their interdependence in action. I was less enthused about the two other parts of the book as I mostly read fiction, but I still enjoyed them nonetheless. When I read Donald Murray's A Writer Teaches Writing this summer, I made a commitment to read more books about the craft of writing from as many great writers as I could. He calls essays and conversations like this "shop talk." So when I stumbled upon this small book at the library, I snatched it up, not entirely sure I'd get to it with the other books I'm juggling right now and all the others stacked throughout my house. But boy, I am glad I took the time to breeze through this. I know Le Guin h When I read Donald Murray's A Writer Teaches Writing this summer, I made a commitment to read more books about the craft of writing from as many great writers as I could. He calls essays and conversations like this "shop talk." So when I stumbled upon this small book at the library, I snatched it up, not entirely sure I'd get to it with the other books I'm juggling right now and all the others stacked throughout my house. But boy, I am glad I took the time to breeze through this. I know Le Guin has mass respect in the literary world, especially as a writer of science fiction novels. I regularly teach her short story, "The Ones Who Walk Away from Omelas" in my high school classes, and I remember fondly, all these years later, of a short story called "She Unnames Them" I read—in college! And that's the extent of my Le Guin knowledge. This is a sweet little book, with some wonderful lines from Ursula K. Le Guin. There are much better books by her. Ursula's words are a treasure and a gift, but this is a slender book for $14.95. Stand in a bookstore and read her words, and then do the smarter thing and buy one of her essay collections. David Naimon is a good writer, but that's not why I bought this book. I have been doling out Ursula's writing to myself a bit at a time to make it last. I read her children's Catwings series. The This is a sweet little book, with some wonderful lines from Ursula K. Le Guin. There are much better books by her. Ursula's words are a treasure and a gift, but this is a slender book for $14.95. Stand in a bookstore and read her words, and then do the smarter thing and buy one of her essay collections. David Naimon is a good writer, but that's not why I bought this book. I have been doling out Ursula's writing to myself a bit at a time to make it last. I read her children's Catwings series. The year before last, I read her YA novels, and I really do not like YA. Hers are good, of course. I read her last book about aging. I still have some poetry to read, the complete translations of Mistral. Thankfully, she had a lot to say. Read The Language of the Night or Dancing at the Edge of the World. You will find the essay much referenced here, "Why Are Americans Afraid of Dragons?" My favorite fiction includes "The Ones Who Walk Away from Omelas" Buffalo Gals Won't You Come Out Tonight , Always Coming Home , and Lavinia. The book arose from a series of interviews Naimon conducted with Ursula Le Guin: Conversations on Writing is the last published book to which Le Guin was an active participant - her death came, says collaborator David Naimon - as the final corrections to the manuscript were being discussed and approved or changed. In a way, how like Le Guin, who retired from writing major pieces of fiction a few years back, to still be involved in communicating her thoughts literally up to the day of her death. I have to admit that the only book I read by her was Steering the Craft. In fact, that's how I first heard of her. I got two of her other books to read them but they just weren't my thing. This book is just what is says, conversations on writing. It's interesting to see her viewpoints on writings, i.e., genre, point of view, and things like that and how they are so much more than what we give them credit for. If you love this author and want to know what makes her tick, then you'll like this book I have to admit that the only book I read by her was Steering the Craft. In fact, that's how I first heard of her. I got two of her other books to read them but they just weren't my thing. This was a fascinating read! I do really enjoy Ursula's thoughts on so many topics. She speaks a lot of truth. I just wish this could have been more in depth on some of the topics, or that there had been a little better correlation between topics discussed and where I might find the essay she originally wrote on that topic. The conversation written down here flows very easily, and very quickly from one topic to the next. I just wanted more! Which, might be because I've not actually read much by This was a fascinating read! I do really enjoy Ursula's thoughts on so many topics. She speaks a lot of truth. I just wish this could have been more in depth on some of the topics, or that there had been a little better correlation between topics discussed and where I might find the essay she originally wrote on that topic. The conversation written down here flows very easily, and very quickly from one topic to the next. I just wanted more! 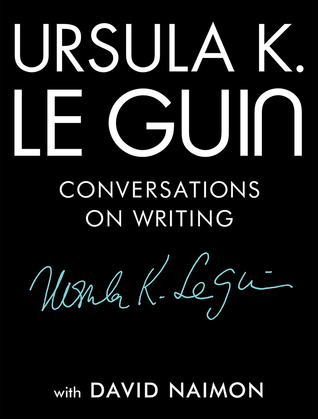 Published posthumously, this series of interviews with Ursula Le Guin is a wonderful introduction to her writing and philosophy of literature. It is broken into parts with chapters on her thoughts on her fiction, poetry and non-fiction. Interestingly, though she writes both sci-fi and poetry she does not feel able to combine the two. I was also intrigued by her thoughts on “genre” vs mainstream writing, a topic that seems to be discussed a lot these days. 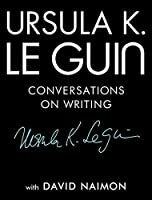 This is a short book of interview transcripts with Le Guin on the topics of fiction, poetry, and non-fiction. The manuscript was still being edited when she passed. The interview questions for fiction were mostly framed around the material she covered in her book Steering the Craft. The poetry discussion was interesting. The non-fiction discussion, that's where the magic is, folks, all twenty or so glorious pages of it. I didn't want it to end. A bit short but still nice. A series of three thoughtful interviews with UKLG about writing fiction, poetry, and non-fiction. Worth reading if you’re a fan or interested in her works. I feel like this book was written just especially for me. An excellent series of interviews and excerpts cutting to the heart of LeGuin's ethos and writing. "Beneath memory and experience, beneath imagination and invention, beneath words, there are rhythms to which memory and imagination and words all move. The writer's job is to go down deep enough to feel that rhythm, find it, move to it, be moved by it, and let it move memory and imagination to find words." "I have put Rilke very high...I like later Rilke. He's a very strange poet and a lot of what he says doesn't mean much to me. But when he says things and it's the music, even I know." Brilliant writing advice, brilliant conversation, brilliant everything. I'm keeping this by my desk to remind me of all the things I'll inevitably worry about / doubt myself about when writing. Too Short by a mile. Loved this, but it left me wanting more. 109 pages of Ursula is not enough. Makes me want to own everything she's ever written. Ursula K. Le Guin in a national treasure & pretty much, complete perfection. She is missed. I came away from this book feeling an enormous amount of respect for Ursula Le Guin, and feeling inspired to learn more and write more thoughtfully.